This impressive machine is one tough lady; although it can haul a bigger load than the C-47 (aka Dakota), it could never make the claim to fame. I like this magnificent machine a lot, but except for Alaska and a few in South America they are, operationally, almost extinct. All photos (c) Ruud Leeuw. Everts Air Fuel transports... fuel. By road you don't get far in Alaska and a lot of communities need their supplies to be brought in by planes, including fuel.. The company started under another name in the 1960s by Clifford R. Everts. They stayed faithful to the Curtiss C-46 Commando. 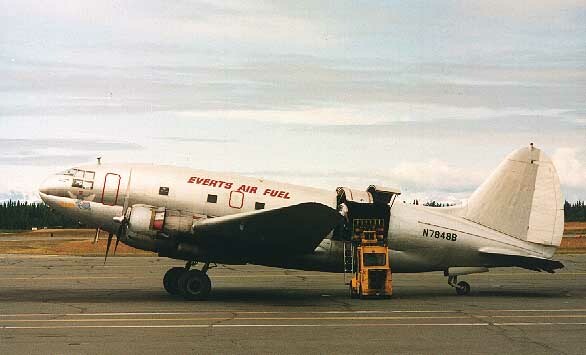 In 1986 the company made the name Everts Air Fuel official and every propliner fan is thankful to them for keeping the Commando airborne... For them it must be less romantic: the C-46s need a lot of maintenance, the weather and economics in Alaska are unforgiven and margins are always slim. N7848B (c/n 273) is awaiting cargo at Kenai, Alaska. Except fuel and general commodoties, the cargo often consists out of fish for the fish factories. 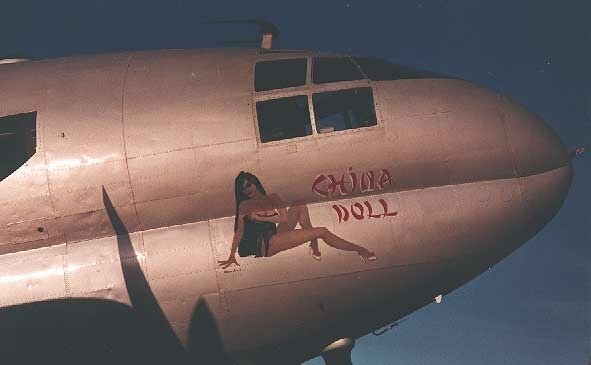 China Doll is C-46 44-78663 (c/n 22486) and shows its prominent 'face'. These old and struggling freighters really fit the picture on the Last Frontier. I shot this close up one fine evening in may 1997 at Camarillo,CA . I think it displays its peculiar front section rather well. Like most of the transport aircraft used by the U.S. during W.W.2, the Curtiss Commando was designed for commercial use, but was converted to meet the transport needs of a country at war. 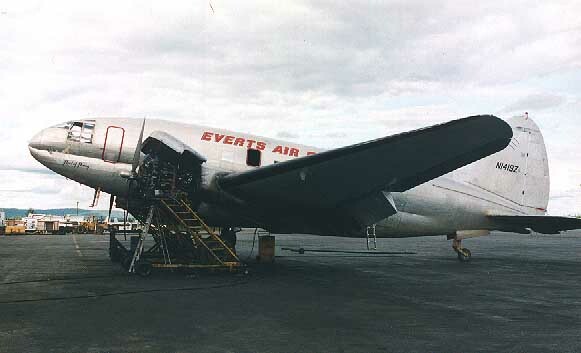 Originally designed in 1936, the C-46 started operational use in 1941. The Commando had a very distinguished career during the War, being one of the few aircraft to see service in every theater of the war. An original order of 25 Commandos was quickly added onto when the USAAF ordered another 1.491 Commandos in the C-46A configuration. 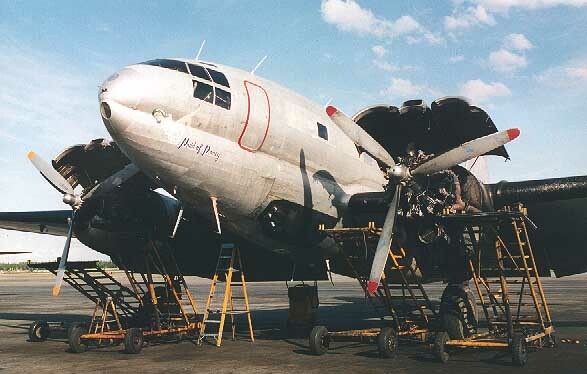 This single cargo door was later supplanted by the twin cargo door configured C-46D (See C-46 Technical Background). This model also had a modified nose and windscreen. Other variations of the aircraft basically differed only by which powerplant was used. Most famous for its operations in the Far East, the Commando was a workhorse in "flying the Hump", transporting desperately needed supplies to troops in China from bases in India and Burma. It flew an incredible variety of cargo, including light artillery, fuel, ammunition, parts of aircraft and on occasion, various types of livestock. The Marines used the Commando in the Pacific island-hopping campaigns, flying supplies in and wounded soldiers out of numerous island landing strips. It wasn't until March 1945 that the C-46 saw duty in Europe. There, it joined Ike Eisenhower in time to drop paratroopers in the push for the Rhine. Though not built in the same quantities as its close cousin the C-47, the Commando nonetheless played a vital role in winning the war. Its huge cargo capacity and long range made it ideal for the vast Pacific campaign, where it played a starring role.